Just beyond the mansion, there is an exquisite garden where the bride waits joyfully for her groom. The sophisticated charm of her gown from In White has a look that is timeless, and the gold sequin gown of her bridesmaid adds a style that is wonderfully lavish and modern! He meets her there with much anticipation dressed in a handsome tuxedo from Filling’s. And Annie Sharp Photography captures the sweetest photographs of them there together – the kind that will someday become heirlooms! The incredible work of Wedding Flowers By Cyndi brings their celebration to life with stunning floral arrangements and unique floral hoops for the wedding party to hold. And the turquoise ombre cake from Rosie’s Creative Cakes is a grand and luxurious design that also looks amazingly delicious! 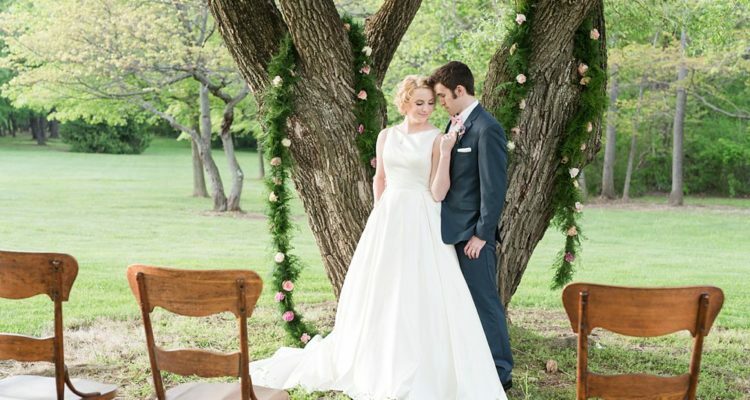 The magnificent rolling hills and all of the beautiful stylings from this amazing team of vendors truly leaves us with the feeling of a fairytale in the making!